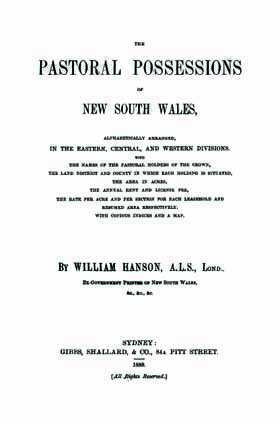 This wonderful genealogy tool is divided into three sections; the Eastern division, the Central division and the Western division of NSW, all containing information on the areas of land owned. Each pastoral holding includes the land district and county in which each pastoral holding is situated; the area in acres; the annual rent and licence fee; and the rate per acre and per section for each leasehold and resumed area respectively; plus the names of the registered pastoral holders of the crown. The information is detailed and includes the date of notification in the government gazette. If you're exploring your NSW ancestry and building your family tree, it's a must.